Our little cottage was located in the woods off South Longyard Road in Southwick. 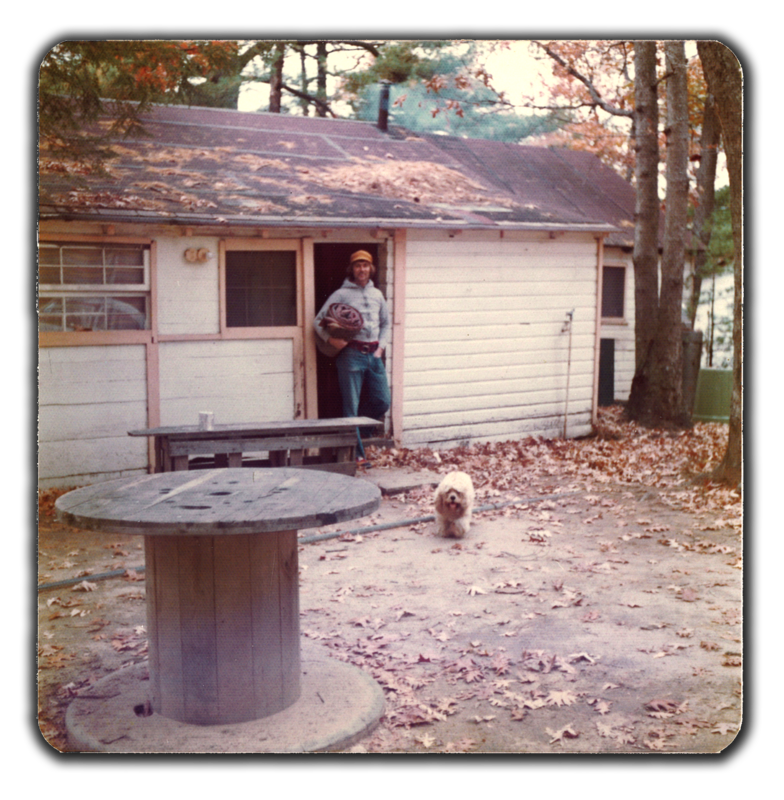 It was among a number of little rental cottages built in the 1940’s collectively called Birchwood Marina. They all had a beautiful view and access to North Pond. The cottages were small but the memories are big. Our cottage was on a steep hill overlooking the lake with lots of steps down to the dock. We enjoyed early mornings with lovely times of solitude when the lake was still and silent. Then there were the happy people, noisy boat times. Ray and I liked both. We loved inviting family and friends to join us there for fun in the sun, swimming, boat rides and perhaps even an attempt to waterski. When we were alone we’d just hang out, swim and sit on the dock until the mosquitoes carried us away, then we’d move to the back porch. If it was a weekend night we’d hear the bands from across the lake at Lakeview Inn. During week nights we were serenaded by the crickets as we sat on the porch in the dark when hot August nights were alive with the sounds of summer. Fall brought the beauty of golden fallen leaves, that nutty fragrance in the crisp air and another mood to the wooded area around the cottages. Come winter, there was a feeling of frosty isolation as we would be the only ones ice skating on the pond. Ray would shoot the puck while Sandy would tear across the ice after it. Then Ray would build a fire in the wood stove to warm us. Every season had its charm. Sandy, our blonde Cocker Spaniel, was a constant companion at the cottage and was a kind of mascot among all the single guys who hung out there. Whether sitting around the dock by day or gathered inside the cottage at night, Sandy would give his pleading stare with those big, watery Spaniel eyes at whoever was eating. Soon he would be jumping up for the potato chips or peanuts being tossed in his direction. 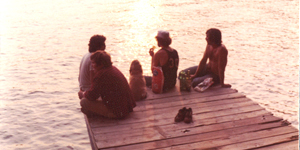 He loved sitting on the dock and I do believe he considered himself one of the guys. He would stand peering over the end of the dock and tremble with excitement for hours watching the pumpkin seed fish swimming around down below in the water. He also enjoyed riding in the boat and was fascinated by Ray fishing. But, most of all, he loved to watch Ray water ski. One time when Ray came close to our dock, purposely spraying water as he passed, Sandy was so overcome with excitement that he leaped off the end of the dock and swam after Ray! Immediately, I saw that there were a number of boats on the lake and I was afraid Sandy would get run over in his determination to catch up with Ray. I quickly jumped in, swam after him and guided him safely back to the dock. Sandy really would have skied if he was able. He loved the fun times at the lake as much as the rest of us. Back then in the 70’s, as Ray talked about the happy times of his youth at King’s Beach, I couldn’t see what he could see because it wasn’t a memory for me. My North Pond memories were just beginning. Years later, what I do of course remember is the little cottage in the woods by the lake where we spent so many days of our early years together. Even back then, we always knew that a day would come when the cottages would be leveled. We heard such rumors going back as far as I can remember. Shall we paint or not? Is it worth risking any improvements when they may just bulldoze down the cottage next summer? Well, that day finally came. Now the woods have grown back and it is as if we were never there. 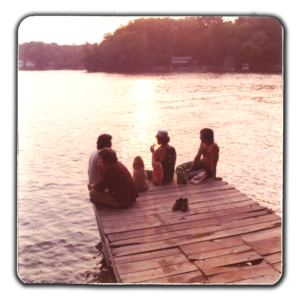 Like our walks back in the 70’s at the former King’s Beach when what I saw was just Ray’s memories painted over the woods in front of me, the little lake cottage, dock and steep steps exist only in our minds and hearts and in those old family photos. So nice to read stories from Toni Ann, she is continuing in her mother’s footsteps. I so loved reading Marilyn’s stories. Kudos!